Meet Bonnie Combs, our 2019 Ocean Spirit Award winner! Bonnie lives in Blackstone, a small Massachusetts community on the border of Rhode Island. Her journey to ocean conservation started years ago with a love of food and continues today with big ideas that exemplify how an army of one can influence two states and multiple communities, inspiring them to join the fight to protect our blue planet. When Bonnie tells her story, it’s best to have a map of Massachusetts and Rhode Island on hand! Her life has crisscrossed these borders and each state could claim her as their own ocean hero. Bonnie’s motto is “be the change you wish to see” and believes everyone can make a difference when it comes to saving the planet. “Some people are just too shy or scared but I say if you just try and get out there, you never know how your efforts might make a difference,” she muses. Always a nature lover, Bonnie had her awakening to conservation while working as a chef at Whole Foods and was drawn into the company’s sustainability mission becoming Community Relations Team Leader. This work, in locations in MA and RI, became her conservation training ground and solidified her interest in working locally to spread the message that you too can choose healthy for your family and in turn, make our world a better place. Bonnie is often using her skills as a trained chef to make sustainable meals or is firing up her sewing machine, stitching up t-shirts for reusable bags, sewing remnant fabric for cutlery wraps and repurposing animal feed bags. A creative energetic change maker, Bonnie is regularly organizing river and beach clean-ups across both MA and RI, teaching folks how to reuse and repurpose everyday materials to mitigate waste, and sharing her talents with the community by empowering others to learn how to make creative choices when it comes to refusing single-use plastic pollution. Bonnie loves networking, outreach and the community participation in the building of a movement. She thinks big! Her newest project takes this concept on, literally. 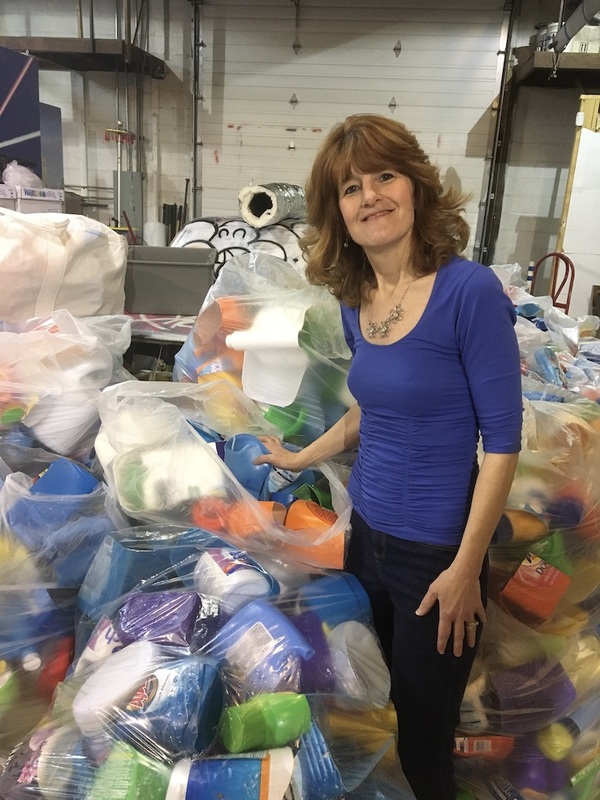 Bonnie is currently a “3D Resident Local Artist” at the Providence citywide public art initiative, The Avenue Concept, collecting a rainbow of plastic containers from across Rhode Island for an enormous public sculpture that will be assembled and constructed on site by famed New York artist Steven Siegel. The entire structure will be assembled from plastic waste including laundry jugs and personal and household cleaning products. The sculpture will be held together by discarded fishing nets and Bonnie hopes the art will spark discussions about how to protect marine life from entanglement and keep plastic pollution out of our waterways and ocean. Congratulate Bonnie on May 21st at W2O’s On the Brink: Saving our Right Whale, Saving our Ocean. Bonnie will be presented the 2019 Ocean Spirit Award at this event that will educate the public about the endangered North Atlantic right whale. Find out how we can save this species, thought of as the “ocean’s canary in the coal mine,” and join us to take a closer look at how we can protect our blue planet. Click Here for Tickets! Boaters will tell you that plastic is their friend for making sure food is fresh and transportable. 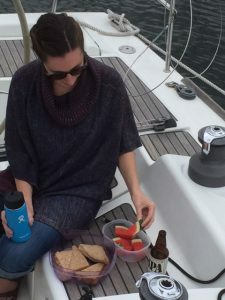 Reusable hard plastic dinnerware and shatterproof glasses are boating standbys, especially for enjoying refreshments above deck. 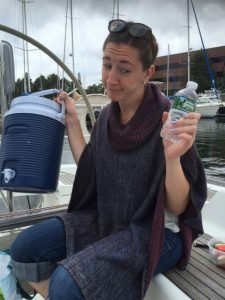 Storing food on a boat means thinking about avoiding condensation and tightly sealed containers that are light weight are the favorite choice. It would be great to decide to go plastic free completely while boating but today a doable goal would be to decide to refuse single use plastic or plastic that we use once and then throw away. There are choices you can make to reduce the amount of plastic pollution that ends up in our oceans. 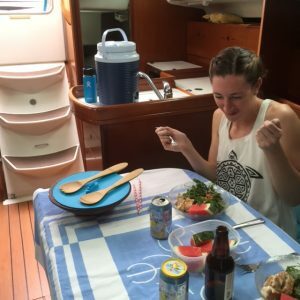 After our visit to Sailors for the Sea, and checking out their “Green Your Galley Guide,” we were inspired to look a little closer at how to make a day out on the water single use plastic free. 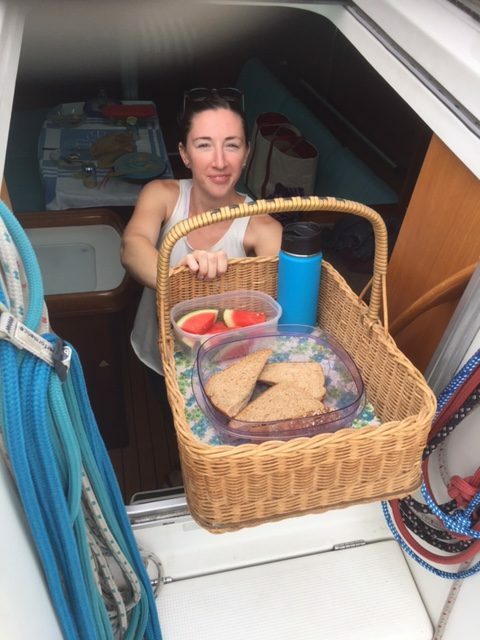 Most day sailors and boaters are really “picnic-ing” on a boat with transportable foods usually eaten at the dock, on a mooring or anchored in a safe harbor. The first step to a plastic free day starts at home. Here are some tips to help you take the important steps to healthy plastic free choices for you, your family and our oceans. Make your food! Create a simple meal at home and avoid picking up prepared foods in single use plastic containers. Transport food in insulated reusable bags in glass or metal containers. 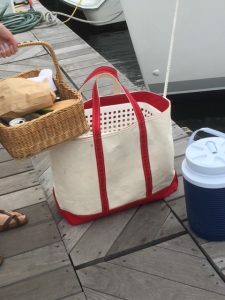 Find a basket with handles, like the one Emily is passing up above, or a deep wide tray for handing food and drinks above and below deck. Bring a large cooler and fill it with ice and water at the dock rather than opting for that case of water bottles. Filling it up at the dock ensures it will stay cold for the trip and is easier to transport from home. Using insulated reusable water bottles are also a handy solution. Life tastes better with real cutlery! Stock bamboo or metal on your boat instead of single use plastic. Transport your gear in reusable bags or choose to invest in a “boat” bag. The one pictured below is 20 years old, has clocked many miles at sea and is still as good as new. The cotton siatka (or today’s string bag) is durable, washes easily and can be very beautiful too. Here are some wonderful examples of siatkas to add to your repertoire of reusable bags. Nix the plastics! Good for you, good for our oceans. Pinterest has bags to own and to make! Some of you have already made your plans for the upcoming school break. Whether you are going to some exotic place or just staying in your “no place like home” environment, exercise some thoughtfulness about our blue planet while on vacation. Breaks from the busy schedules of work and school are are good time to think about fresh ideas and an easy time to try something new. Did you pack an empty reusable water bottle and reusable bag for the journey? Will your kids pledge to turn out the lights in their rooms each day before heading out from home base? Are you choosing restaurants that are conscientious about keeping a green/blue establishment? Taking a book? Try BlueMind by Wallace J. Nichols, a book that speaks to your love of the oceans. Bring W2O blue mindfulness on vacation this year!